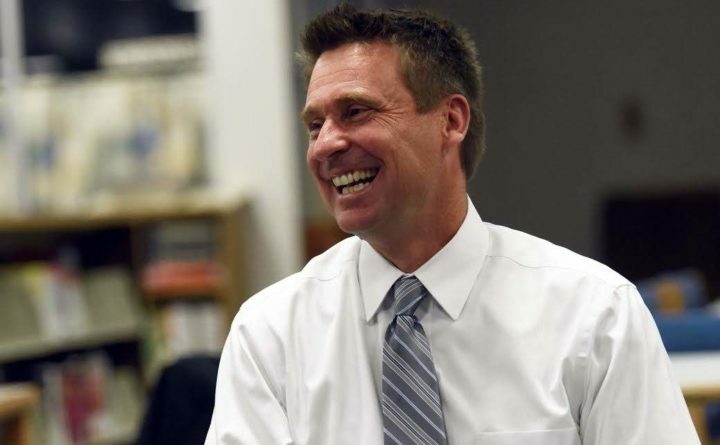 York High School Principal Karl Francis interacts with parents and staff in this Seacoast Online file photo. Francis and Assistant Superintendent Anita Bernhardt presented a proposal to the School Committee to drop the proficiency-based graduation requirement, until recently required by law, in favor of a more traditional grading and credit system. YORK, Maine — The School Committee here has adopted a credit-based diploma, no longer using proficiency-based learning targets to award diplomas to graduating students. The credit-based diploma plan was presented to the committee by York High School Principal Karl Francis and Assistant Superintendent Anita Bernhardt on Wednesday, Aug. 15. On July 10, Gov. Paul LePage signed a law that makes the implementation of proficiency-based diplomas optional, they said, so school districts can now determine how to proceed to best meet the needs of their students. Under the credit-based diploma, reporting on course achievement will be done using a 0-100 grading scale on report cards and transcripts, and credit will be awarded to students with a 70 (or above) average in the course. Course averages will be used to calculate GPA, determine co-curricular ability, establish honor roll, and identify the valedictorian, salutatorian and top 10 percent of students in each graduating class. “Student achievement will be recognized as it has historically been recognized with honor roll, with valedictorian, salutatorian, top 10 percent of the class, some of the historical things that we’re familiar with will be in place,” Francis said. While teachers will still score and track student abilities on performance indicators, students will not be required to meet a specific level of performance in any performance indicator to pass a course or receive a diploma. These indicators will be used to “inform instructional practices,” Francis said. York began working to create the framework for a proficiency-based diploma about two years ago, but the proficiency-based grading system raised concerns for some parents and teachers. “The law still requires that we create a program of studies that is aligned to the system of the Maine Learning Results so we’ll continue to be sure that we’re very clear about our standards and our learning targets and that our curriculum is aligned to those learning targets and standards and that our assessments also reflect that,” Bernhardt said. Francis said the presentation before the committee, and its acceptance, was the first step in beginning to communicate the plan to the community. He said there will be opportunities for informational sessions and for parents to reach out to administrators with any questions they may have.